According to data ascertained by diplomatic establishments abroad through their Japanese citizen protection work in2003,6,253offenses were committed against Japanese nationals overseas in2003(down12.0%from2002),involving7,004Japanese nationals as victims(down14.8%from2002)(Source Data:Consular Affairs Bureau,Ministry of Foreign Affairs). Fig. 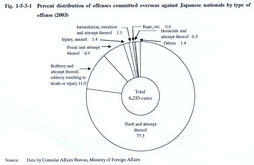 1-5-3-1 shows the percent distribution of offenses committed overseas against Japanese nationals in2003,by type of offense.The majority of the offenses were theft,accounting for77.3%(4,832cases)of the total,followed by robbery(686cases or11.0%)and fraud(430cases or6.9%). Overseas offenses were committed in Europe(2,598cases or41.5%),followed by Asia(1,942cases or31.1%),and North America(657cases or10.5%).Common offenses in these three regions were as follows:in Europe,the most common was theft at86.5%(2,246cases),followed by robbery at9.2%(240cases),and fraud at3.1%(81cases);in Asia,the most common was theft at67.3%(1,307cases),followed by fraud at14.1%(273cases)and robbery at10.7%(208cases);in North America,the most common was theft at85.8%(564cases),followed by robbery at4.4%(29cases)and fraud at3.7%(24cases).Theft accounted for the largest share in all these regions. Japanese nationals killed overseas in crimes have been within the10-30range since1992(fiscal years until1994and calendar years thereafter),including27in2003.On the other hand,persons injured due to overseas crimes such as injury,assault,and robbery etc.were275in2003,a decrease of50from2002but a2.3-fold increase from the119persons in1994.